Natural remedy formulated from plant extracts that offer stress-fighting benefits. Used for relieving symptoms of fatigue, boosting cognitive performance and promoting well-being. 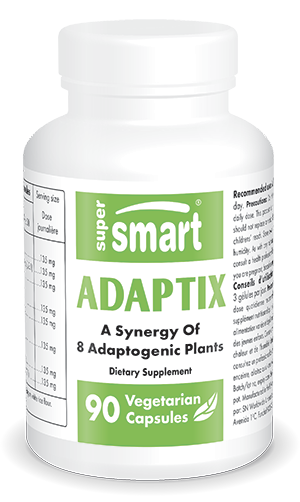 Adaptix is a synergistic blend of eight plant extracts with adaptogen properties that improve the body's ability to cope with all types of stress, whether occasional or chronic. Together, the eight extracts in Adaptix help relieve the symptoms of fatigue, boost stamina, and promote emotional and mental well-being. ¤ Extracts of rhodiola root (Rhodiola rosea), schisandra berry (Schisandra chinensis) and Korean ginseng (Panax ginseng) support mental performance and physical capacity in cases of occasional stress. They also encourage the body's adrenal-sympathetic system to respond in a balanced way to stress-induced acute reactions. ¤ Extract ofashwagandha root (Withania somnifera) supports healthy thyroid and gonadal function during stressful periods. ¤ The increase in cortisol levels seen at various stages of stress is moderated by schisandraextract. ¤ Extract of astragalus root (Astragalus membranaceus) is traditionally used in Chinese medicine, particularly to help protect the body from various types of stress - physical, mental or emotional. ¤ Extract of reishi also helps to combat stress. In the East, doctors have shown that it significantly reduces emotional outbursts caused by the effects of long-term stress. ¤ Extract of suma root (Pfaffia paniculata), or Brazilian ginseng, is traditionally used to counter the effects of stress and stimulate energy. Other ingredients: magnesium stearate, cellulose, silicon dioxide dioxide. adults. Take 3 capsules a day or as advised by your therapist.